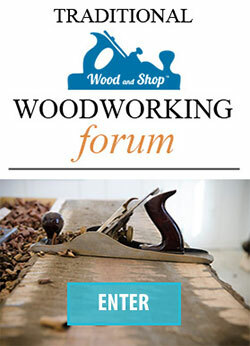 The beading plane provides one of the simplest molding designs, yet one that has a distinct functional purpose in furniture construction. 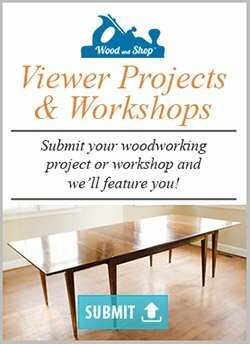 You see beads in a wide variety of uses, including along tongue and groove joints, the inner edge of frame and panel joinery, the bottom edges of table aprons, door and sash constructions. The shape of the profile, a half circle separated from the field by a narrow quirk (groove), is very harmonious. Functionally speaking, the bead provides a line of shadow to disguise transitions in design elements. I use beading planes a lot in my work and in my teaching. Roy Underhill and I also co-teach a workshop that uses molding and beading planes, so I am constantly working these up for the students to use. 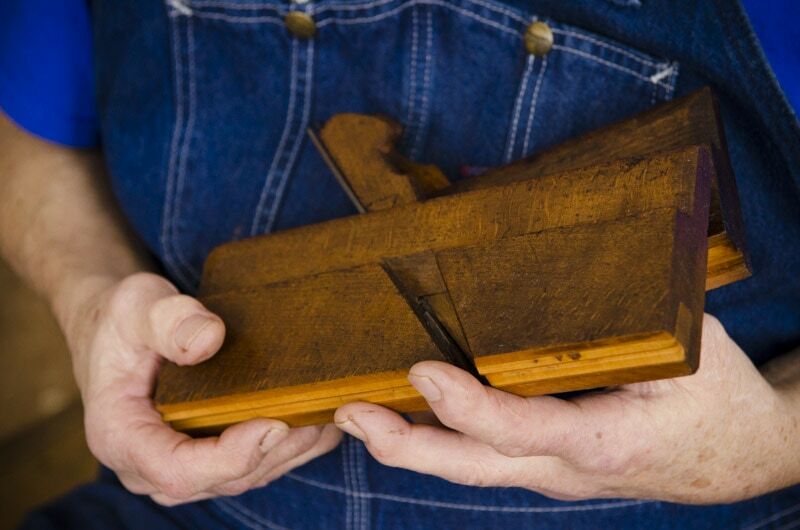 I also teach workshops on wooden plane restoration. There is a lot of interest in putting old tools back into functional shape, in my mind for the satisfaction of returning beautiful old tools to the shape they were meant to be in. For me, the romance of using a tool that has been used by many generations previously of craftsmen/women is both an honor and a commitment. First, a little about beading planes in general. 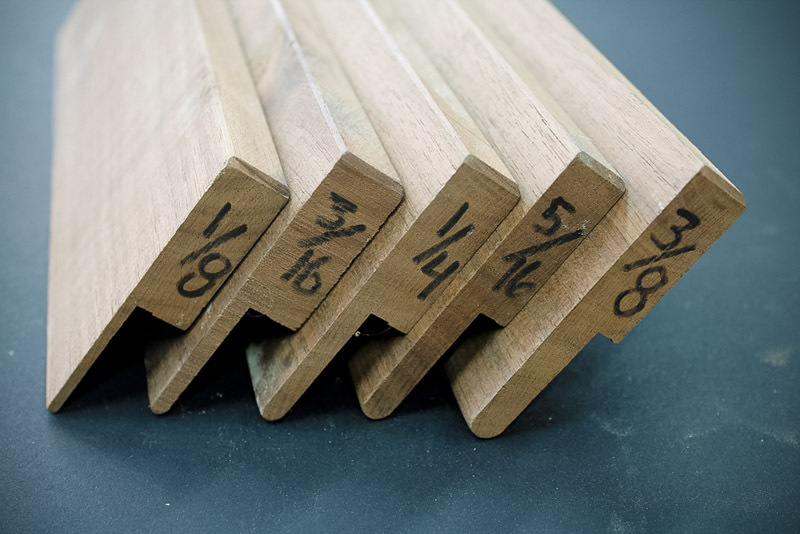 The planes are meant to be used vertically (i.e., no spring) and essentially cut a half round profile separated from the field by a narrow groove (the quirk). The narrow quirk gets a lot of wear, consequently this part of the plane is invariably strengthened with a strip of boxing. 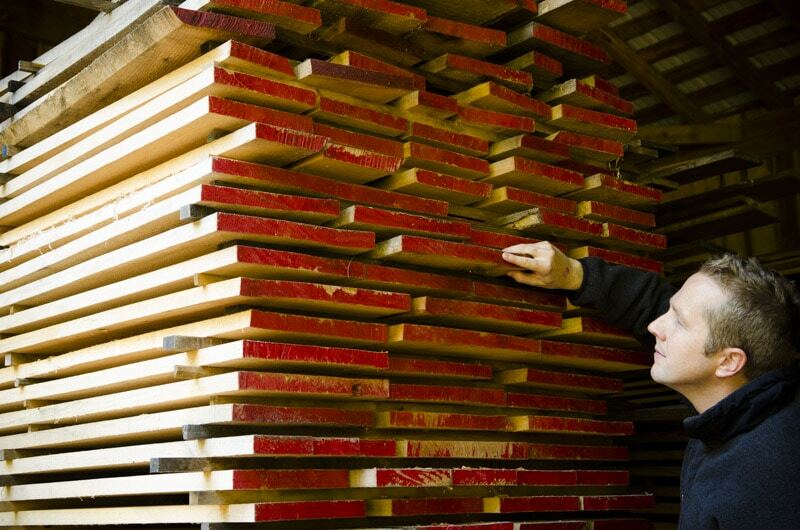 The boxing is generally made of boxwood (often Turkish) which is a very dense tight even-grained wood. 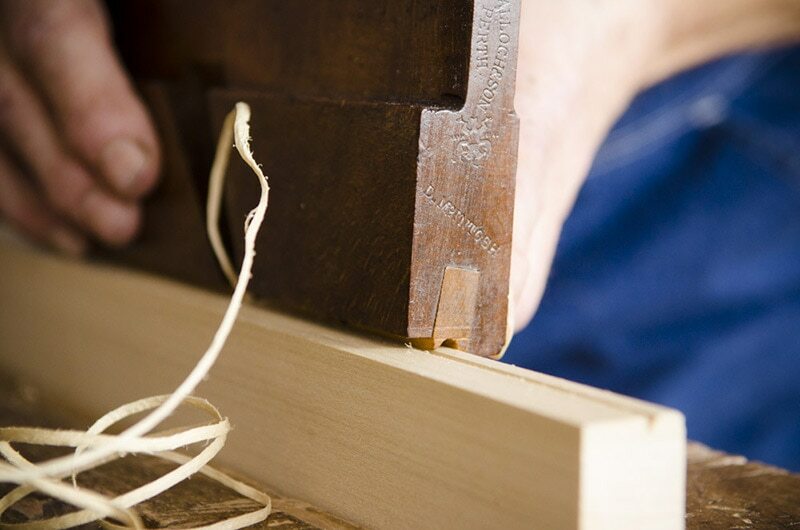 The boxing is cut and assembled so that the grain of the wood runs at 45 degrees to the length of the strip, with the end grain pointing to the toe. Endgrain is generally about 3-5 fold more resistant to deformation than long grain, so this is a very effective use of the properties of the wood. The reality however is that the beech and the boxwood are very different woods, with crossgrain orientation, so that it is not uncommon for boxing to be loose. 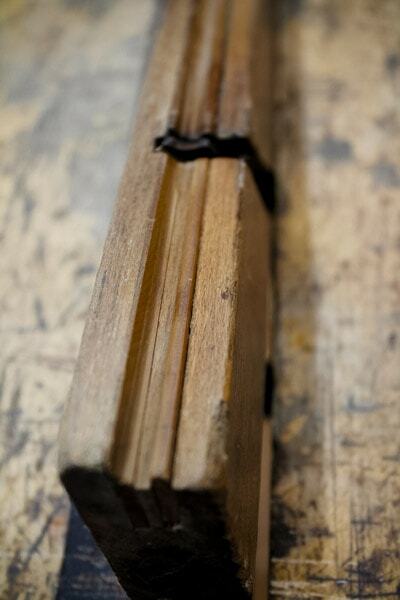 This can be either from wood movement or from the deterioration of the glue (presumably hide glue). 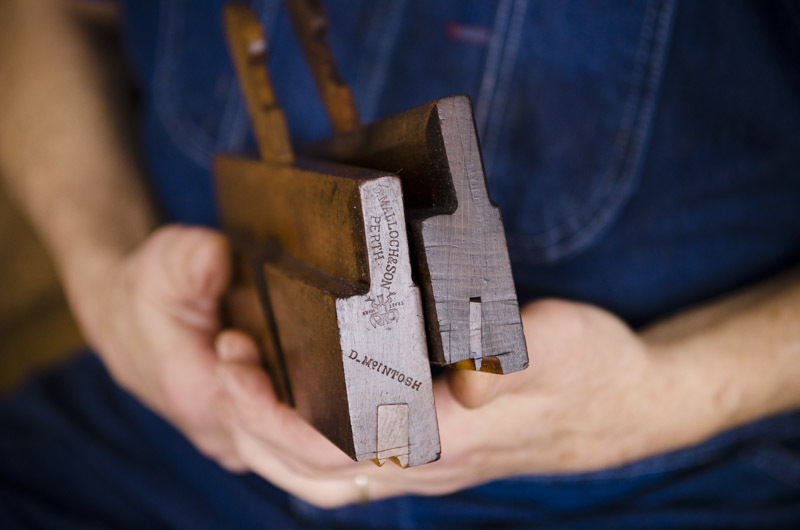 The photo shows four ½” beading planes with different sorts of boxing configurations: single boxed, double boxed, full boxed and a slipped single boxed plane. 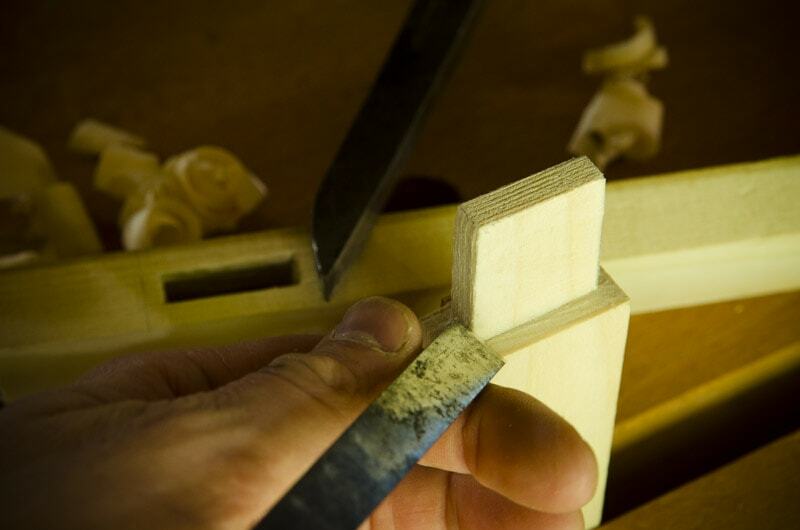 The slipped portion of the latter plane (actually the depth stop) can be removed so that a bead can be added up against an existing design element in a piece of molding. It is possible that the full boxed inserts are sometimes pressure fitted because of the large amount of surface area encompassed by the boxing details. The figure below shows a stylized profile of a beading plane. 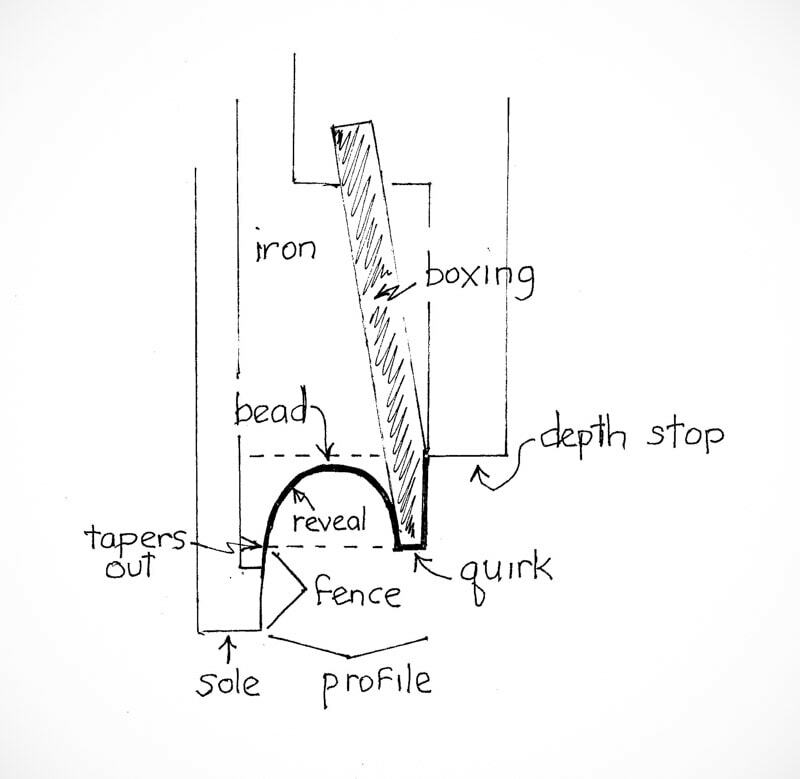 There is the sole, the fence (the portion of the sole below the bottom of the quirk), the round profile, the quirk, and then the depth stop. The depth stop is just a hair deeper than the top of the curve to allow the complete curve to be cut. 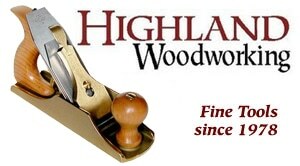 More often, the number stamped on the end of a beading plane indicates the full width of the profile (half round plus the width of the quirk). Therefore, the width of the curved portion is generally at least 1/16” narrower than what the stamp indicates. Occasionally, the width is stamped for the curved portion only. This variation is undoubtedly related to the conventions of the manufacturer, but it is good to actually measure the profile if you are looking for a specific width. The curved profile is not actually 180 degrees of curvature. I have about 75 beading planes in my collection. Selecting planes that showed minimal wear, I measured profile widths (1/4” to 1″) comparing the depth to the width of the curve at the bottom of the quirk. In general, the depth (or height of the bead) was about 42% of the width. This corresponds to an arc of 160 degrees. If the height of the curve was half the width, then the profile would be a half circle (180 degrees). 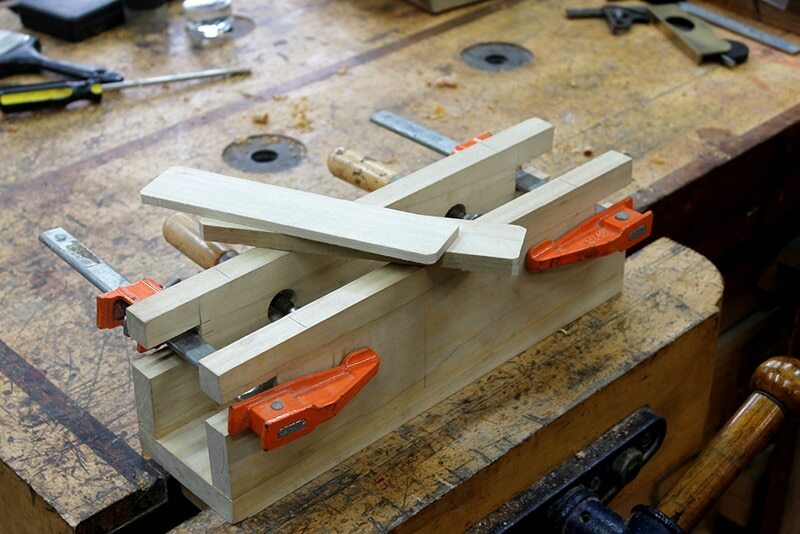 I also measured the width of the fences on all of my 1/8”, 3/16”, 1/4″ and 5/16” beading planes. The 1/8” planes had wildly varying fence heights. The 3/16” planes had fences of about 1/16”, the 1/4″ planes had fences of about 3/32”, and the 5/16” planes had fences of about 1/8”. 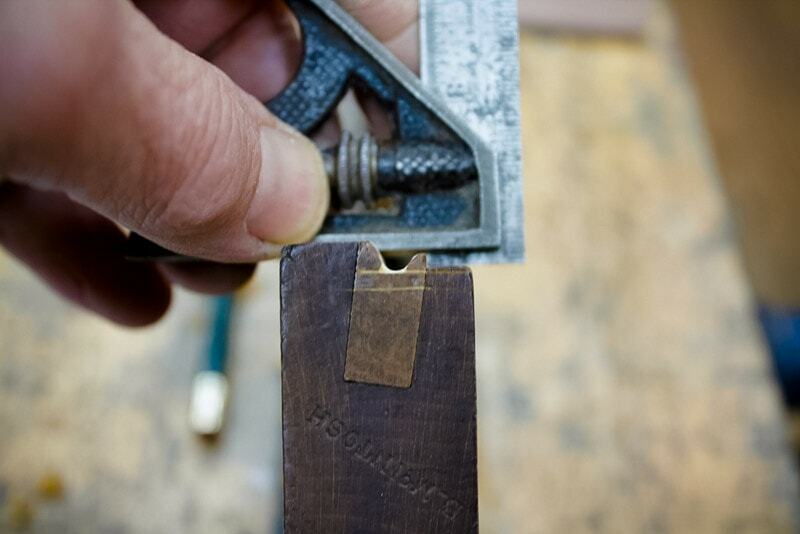 (Note, that if you are going to use a plane to bead one edge of a tongue and groove joint, the span between the sole of the plane and the depth stop must be less than or equal to the shoulder height above the tongue of the joint). 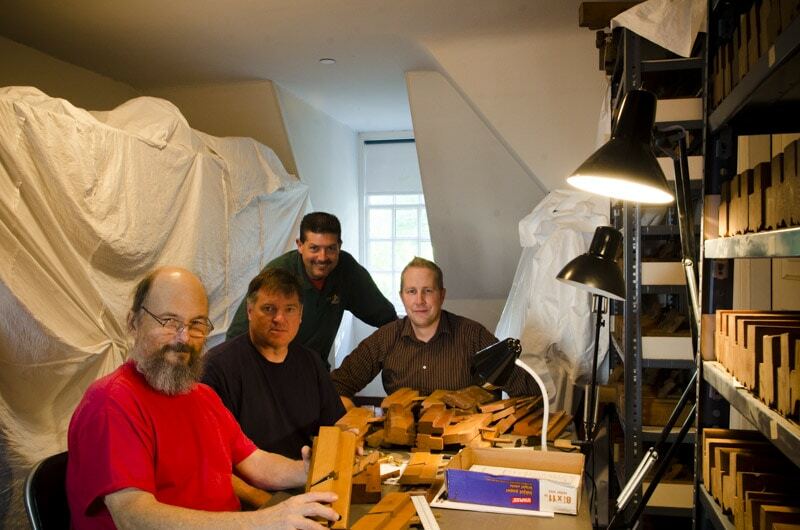 I have recently been conducting a study of the mother plane collection at Colonial Williamsburg, along with Larry Preuss and Joshua Farnsworth. This collection includes a number of beading mother planes. Those planes were probably made in a pattern shop belonging to the plane manufacturer (Chapin-Stephens, CT). 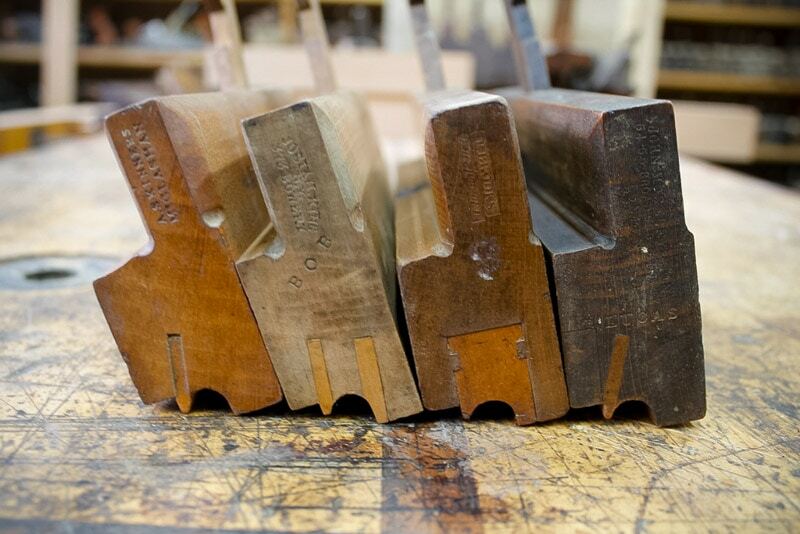 All of the layout and scribe lines for the profiles are on both the toe and heels of each plane, showing that the planes were laid out and cut by hand. In the picture below, you can see that the profile is laid out with two compass points. One point defines the arc of a circle that the particular bead is based on, and another compass point is offset just below that. That offset corresponds to the 160 degree arc that I measured on actual beading planes. One last consideration would be a concern about how much the mouth is opened by a modification of the profile. A wide mouth is generally associated with a lesser quality planed surface. If you look at how the iron cuts the profile you will see that only two portions of the iron actually slice the grain: the bottom of the quirk and the bottom/top of the curve—those portions straight on to the direction of the cut, and these have a conventional bevel angle. The sides of the profile (the shoulders of the curve) are essentially cutting at right angles to the direction of the cut, in other words more of a scraping action. Those portions of the iron are beveled at a much more obtuse angle. 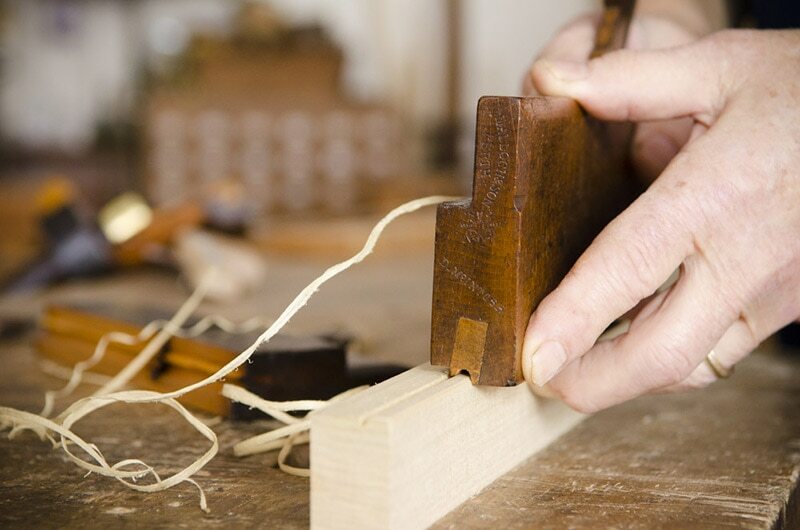 When using a beading plane, the quirk cuts first, followed by the two shoulders (scraping generally gives a finer cut), then finally the top of the curve. That means the portion of the profile cut last, which involves possibly the greatest danger of tearout, is that portion cut when the profile is almost complete and just about to bottom out on the depth stop. In addition, if you look at the mouth opening for a 1/8” thick iron bedded at 45 degrees with a 10 degree abutment, the opening could be about 7/32”. 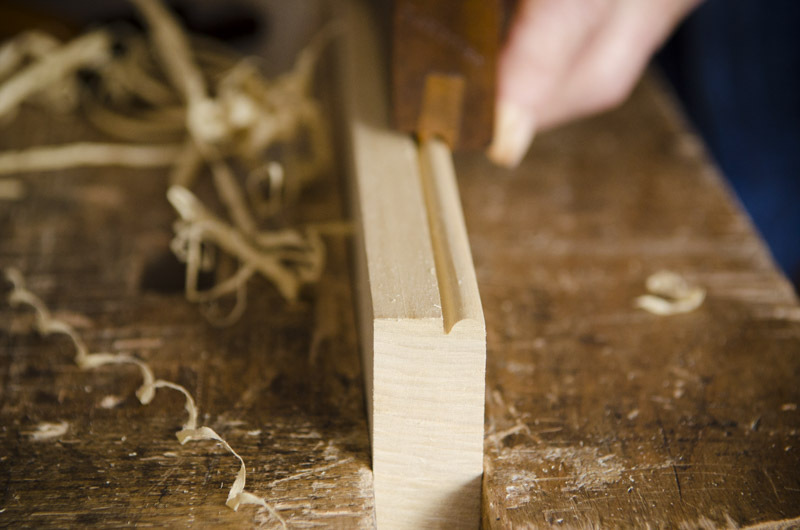 If you cut the profile in a further 1/8”, for example, you will widen the mouth by about 1/64”. The slight difference is due to the closeness between the abutment and the bedding angles. With all of these numbers at hand, it is pretty straightforward to plan out how to recut the profile to restore it to a conventional shape. The first things I look for in a beading plane are whether the iron and the wedge are original or are inappropriate replacements (distressingly common!). I check to see if the boxing is intact and how worn it is. Often, on the boxing of the toe, half of the plane is very worn down, and I think this is partly for two reasons: (1) users tend to put more pressure on the toe when planing (especially finishing out the stroke with more power at the end), and also (2) there is inadequate follow through at the end of the stroke so that the stroke finishes out curving left or right instead of straight through. If the boxing is loose or there are missing parts to the plane, I generally repair these first. Completely loose boxing is reglued with hide glue. If the boxing is a bit loose, but I cannot get it out, I will dribble in thin CA glue followed by thicker glue (I think the wetting action of the thin glue helps to draw in the thicker glue, but not proven however). Taking out glued-in boxing, for whatever reason, requires a lot of determination and an ability to take risks. 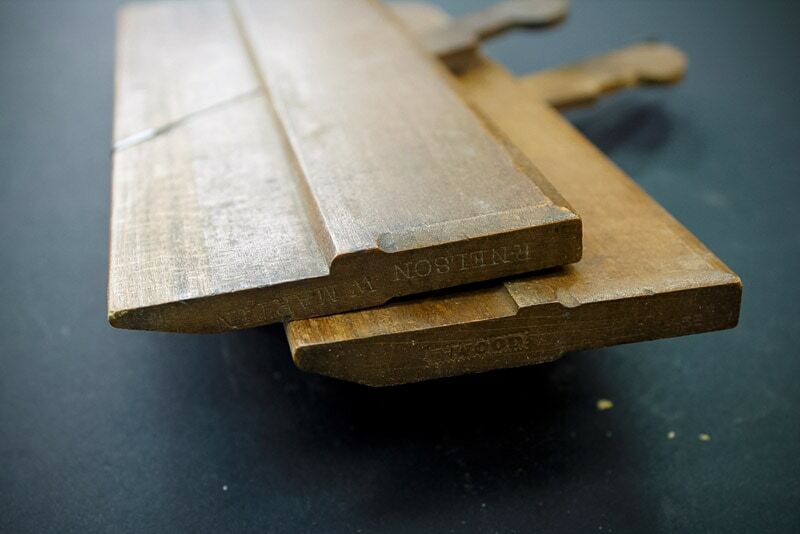 In order to loosen the old hide glue, you will need to steam the glue surface. There are two approaches to adequately get steam into all parts of the joint: (1) drill holes down into the boxing and fill these with water, then steam or heat with a heat gun, or (2) drape the boxed area with a moist cloth, then heat with a heat gun. The risk of wracking the plane body is high. 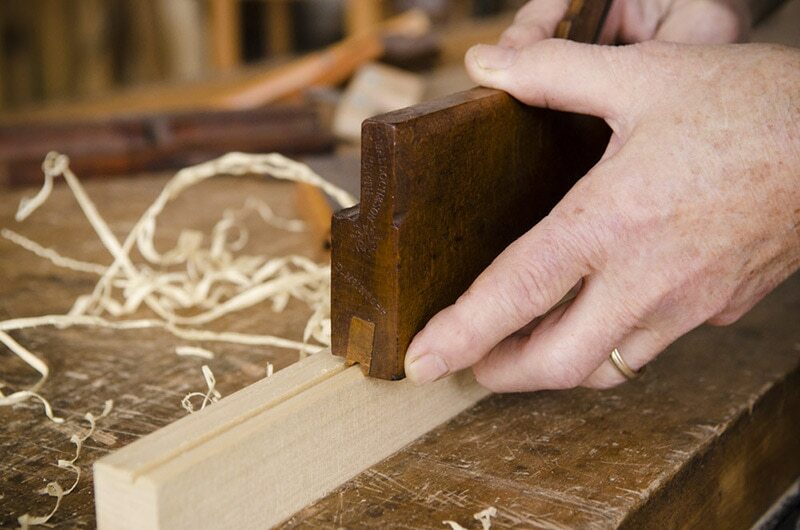 An alternative method would be to chop out the boxing with a narrow (less than 1/8” wide) sash chisel. This is a good solution for an isolated fix. I generally make boxing replacements from riven hard maple or persimmon, cut and reassembled for the appropriate grain orientation, then planed to fit. Worn down boxing is not a problem. If you look at boxed planes, you will see that the boxing is set in to a depth of ¾” to 1”. I suspect that the boxing was set into the plane stock before the profiles were cut and the extended depth of the boxing gives leeway for the shaping process. This depth of the boxing makes restoring the profile a cinch. Round Planes: I use a No. 1 or No. 2 round plane to rough out the profile for the narrow beads. The round plane used needs to be narrower than the beading plane’s profile because it only cuts a 60 degree arc, yet I need to have enough play to work the full 160 degrees. 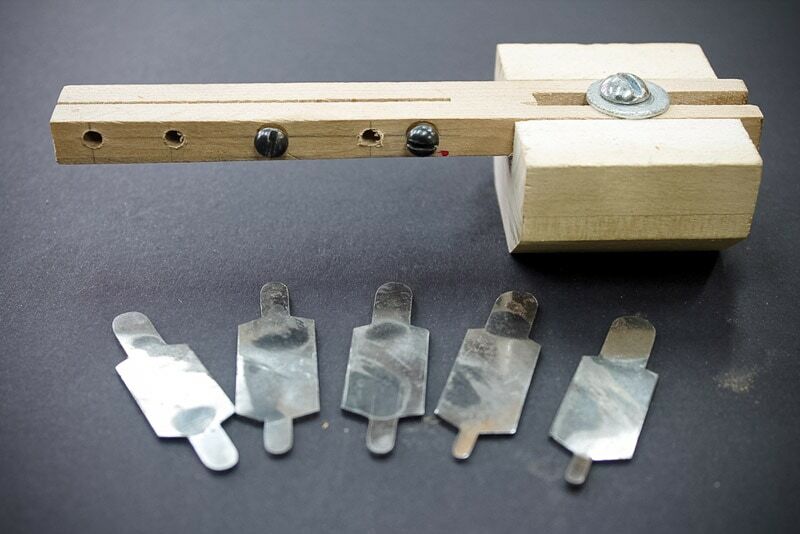 Scraper: I have designed a scraper jig that allows me to scrape the full length of the profile and is about 5” longer to allow follow through to ensure a flat profile. The cutters are shaped to give a different size at each end (in 1/16” increments), then hardened but not tempered. 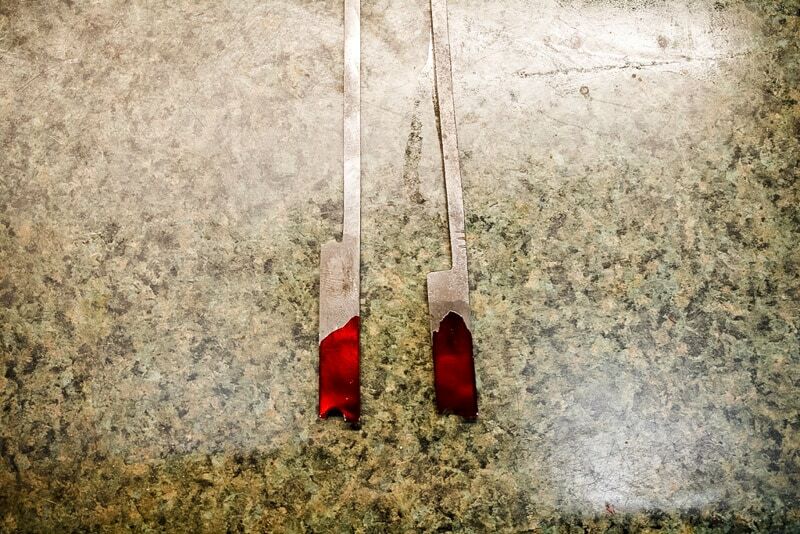 If they are tempered, they tend to bend during scraping since they are often extended a bit. The scraper holder allows me to span the width of the jig for support, and to adjust the cutter both vertically and horizontally for precise positioning. 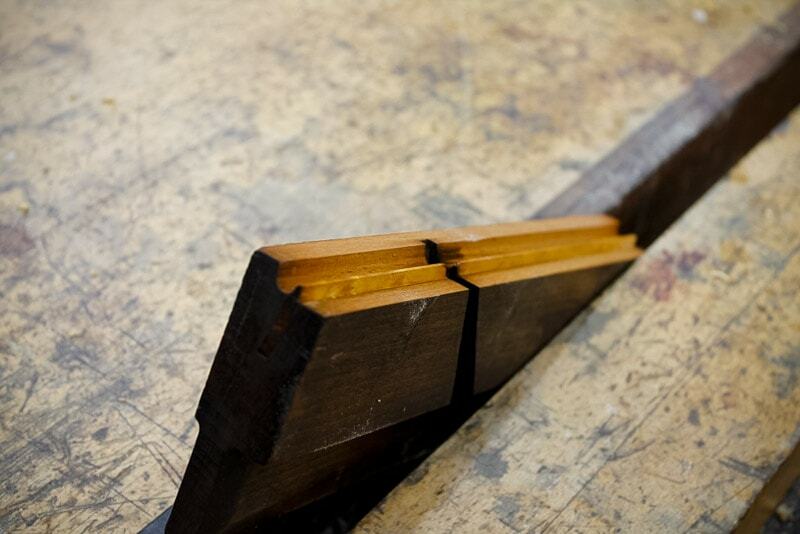 The plane body is clamped within the fixture and shimmed so that the sole of the plane matches the top of the jig. 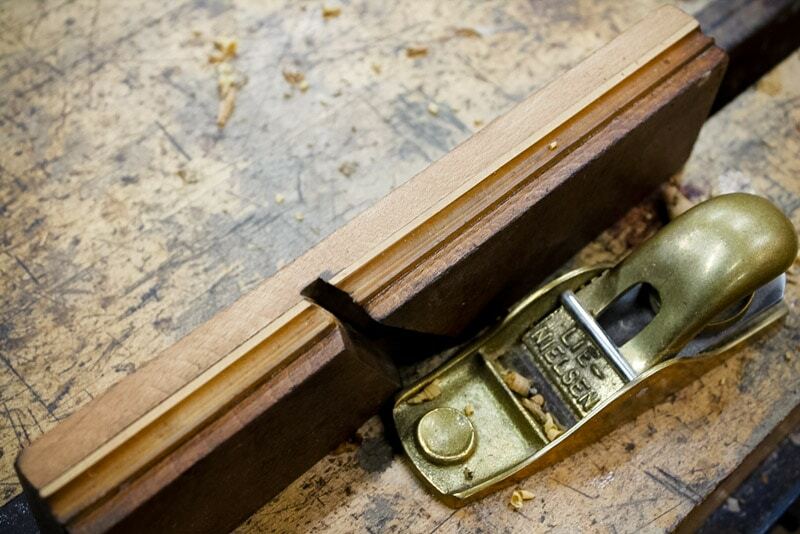 If the plane body is warped, the scraper jig allows me to scrape a straight profile regardless. The scraper cleans up after the round plane and establishes the precise profile. 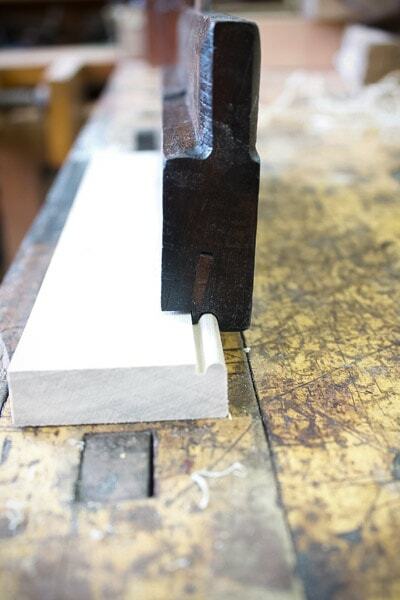 Sanding Blocks: I made a set of sanding blocks to sand the curved profile of the planes. The width of the sanding blocks is adjusted so that the thickness of two layers of 150 grit sandpaper establishes the correct profile width. I use the sanding blocks to refine the surface of the profile after scraping. Combination square, 4”: I use a combination square to reference off the sole to establish the parallel height of the quirk and of the depth stop to the sole and to establish that the outside face of the quirk is parallel to the fence. 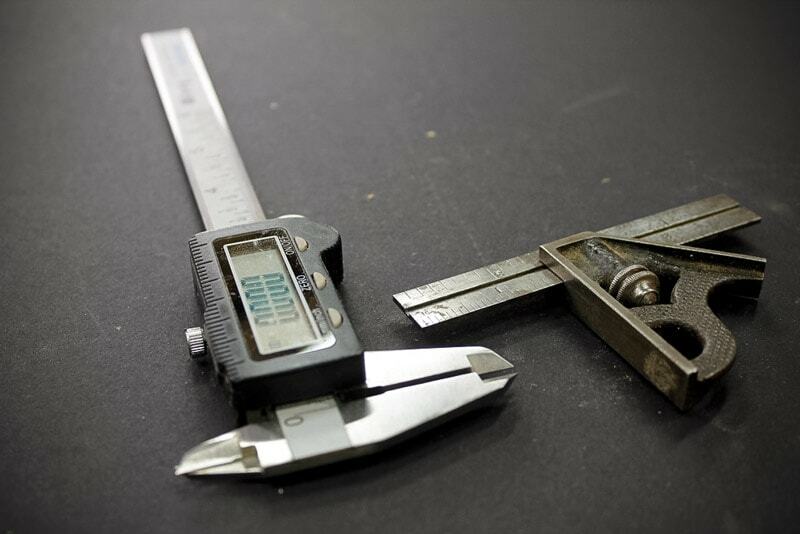 Micrometer: I use a digital micrometer to tweak the profile along with the combination square. 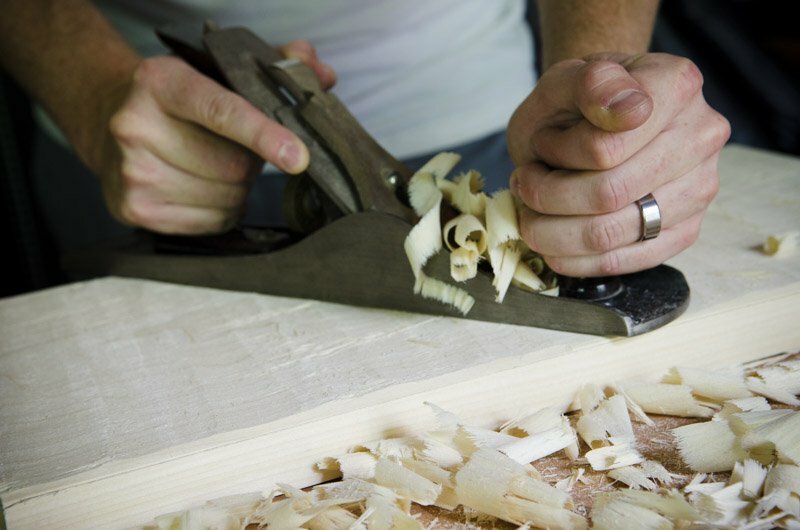 Shoulder plane, ½”: This is probably the handiest and most used tool in my toolbox. I use this to plane down the boxing, to establish a straight fence and to bring down the depth stop as needed. I will be demonstrating the restoration of two planes. 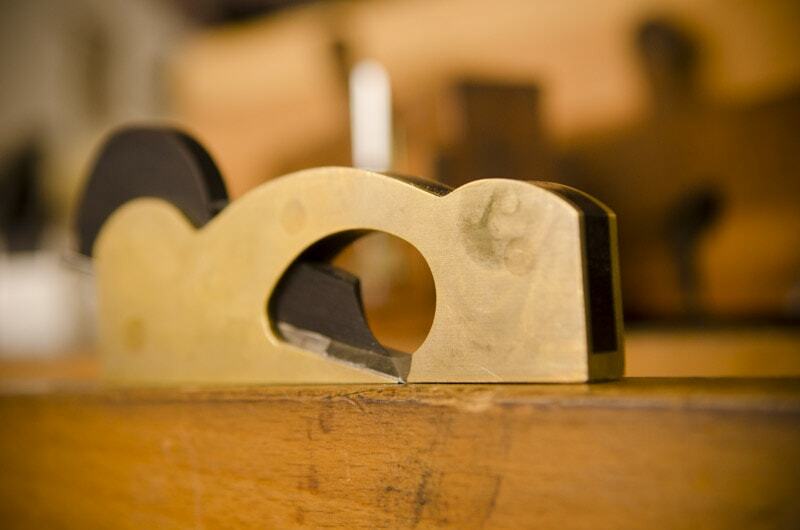 The first is a 3/16” (theoretical 0.188”) plane made by D. Malloch and Sons (1850-1913). The actual width of the profile was 0.259” and the width of the curve was 0.202”. This plane is fully boxed, and the iron is in need of regrinding. 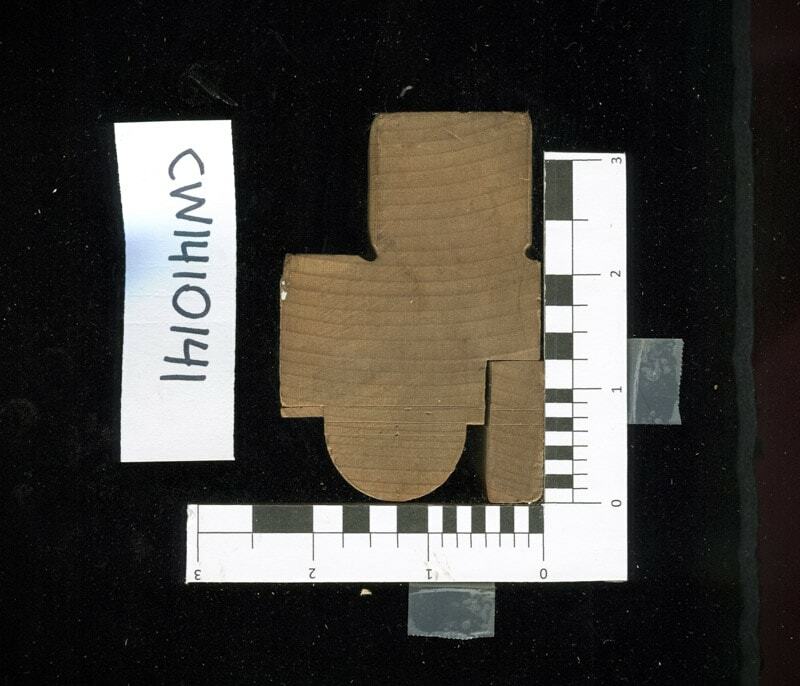 The second plane was a ¼” beader (theoretical 0.250”). The actual width was 0.316” and the width of the curve was 0.229”. There is a maker’s stamp, with serrated border apparently containing the letters L(?).HAR??? ?, but very faint. I could not find this stamp in either Goodman’s British Planemakers from 1700 or Pollack’s Guide to the Makers of American Wooden Planes. This appears to be an English plane due to the heavy black coating and the fact that it has a W. Butcher iron. However, the Butcher iron is an inappropriate replacement. I will call this the Butcher plane. The wedge finial design would indicate mid 1800s at the earliest. This plane was single boxed. 1. The Malloch plane. The Malloch plane had a slight banana shape along its length. I planed this straight and square to the left cheek. The boxing was a bit uneven along its length, but well proud, so I planed the quirk straight and flat along its length and to 1/8” or so below the sole. I laid the shoulder plane flat on the quirk and planed the fence straight and true with a couple of strokes. I laid out reference lines on the heel and toe (measured from the sole) to indicate the depth of the final profile (fence plus 42% of the width of the final curve). I used a No. 1 round to plane the curve to just shy of the layout lines. I clamped the plane in the scraper jig and set the scraper to cut the profile flush with the fence surface I had trued, and just to the layout lines (a couple resettings of the cutter were needed). I sanded the curve smooth and straight with the sanding blocks and 150 grit sandpaper. 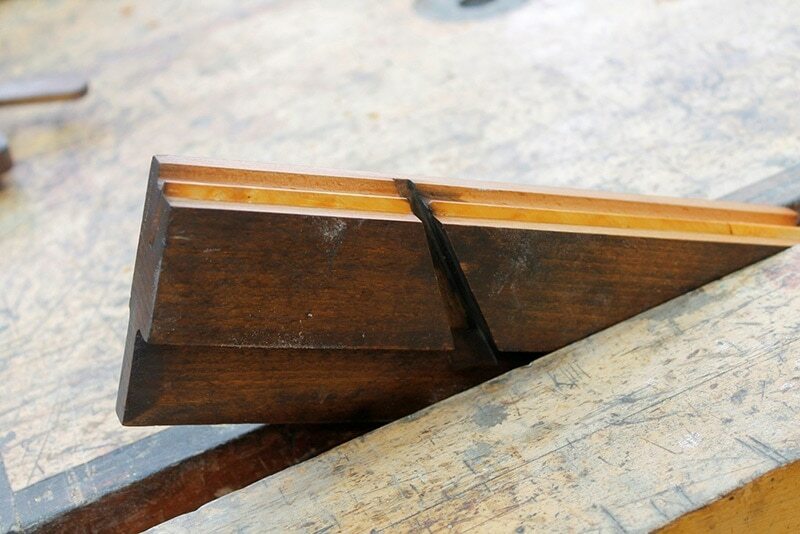 Lastly, I planed down the depth stop to just below the top of the curve, matching it at both ends of the plane and checked with a straight edge. I also planed the outside shoulder of the quirk to be straight and parallel to the fence and just under 1/16” thick. It turned out to be a beautiful beading plane that cut like new! 2. The Butcher Plane. 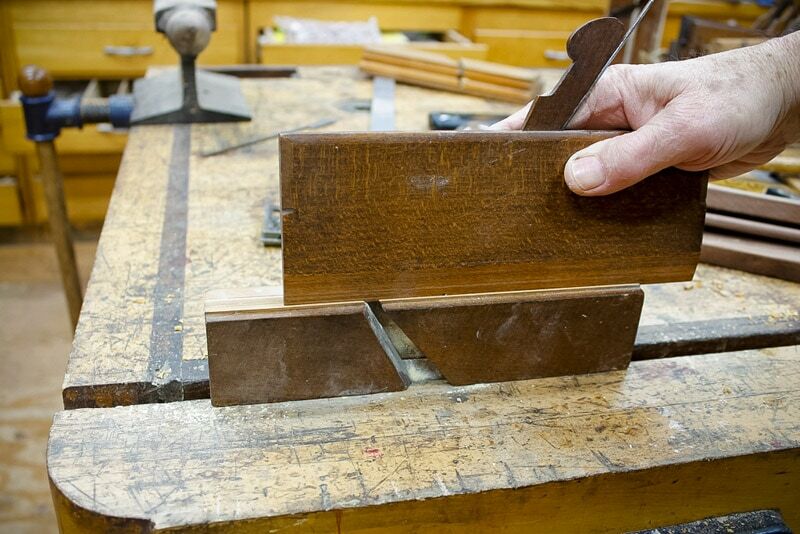 This plane was curved slightly from heel to toe, but not warped at all. However, the boxing was worn down. In addition, the person who replaced the missing boxing at the heel planed away most of the quirk when they were establishing the depth stop, making the quirk a knife edge at the heel. I planed the sole flat and straight. I planed the quirk almost completely away to reveal enough width of the replaced boxing to cut a new quirk. In addition, I had to move the profile towards the left cheek a bit with the shoulder plane (i.e., shift the fence leftwards) since the boxing insert was angled. This would ensure a quirk composed completely of boxwood. All of this I did with the combination square, the micrometer and the shoulder plane. As with the Malloch plane, I blocked the profile out with a round, scraped and sanded the curve to a constant depth and width, then adjusted the depth stop. Interestingly, as I was scraping the profile, I noticed a pair of odd looking shavings creeping out of the two exposed edges of the boxing down in the throat. 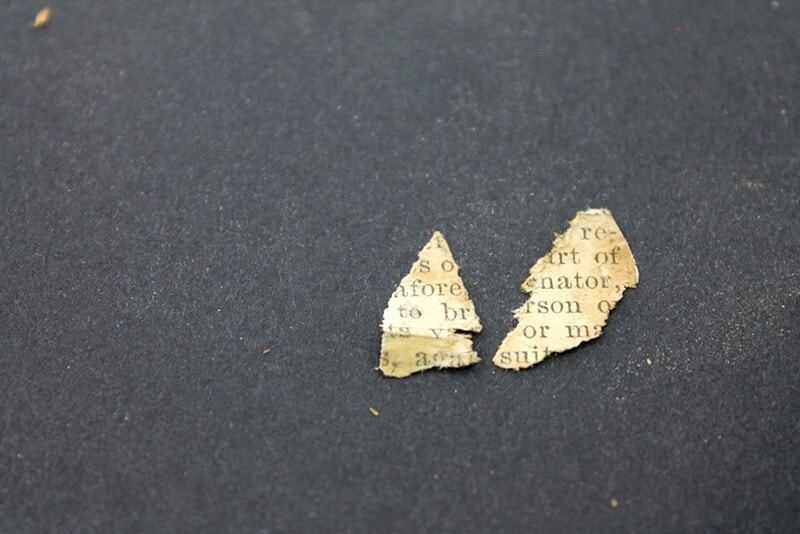 I picked these out with tweezers and found that they were pieces of very old newsprint doubled over to shim the bottom inside edge of the boxing, probably when it was installed! I ran some CA glue down into the boxing at this edge to stabilize the insert, and then clamped the stock up for an hour to let the CA glue set. Because I had to lower the quirk so much, the fence was quite high. I planed the sole down so that the fence was about 1/8” below the quirk. I gave both beading planes two coats of Minwax Antique Oil Finish to seal the exposed wood and even out the patina. This finish is a high build, quick drying oil finish. You can find this finish here. Both irons were wire brushed to remove rust. The faces of both were ground and polished to 3600 grit on my WorkSharp (see the model here), then painted with bluing, or layout fluid (find it here). 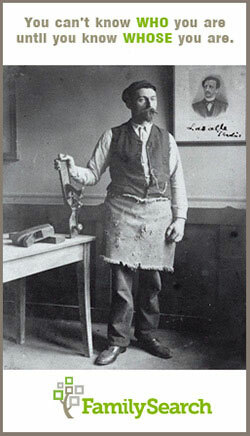 The irons were wedged in the throat so that they were proud at the mouth all along the profile by a modest amount. The new profiles were scratched onto the faces with an awl. 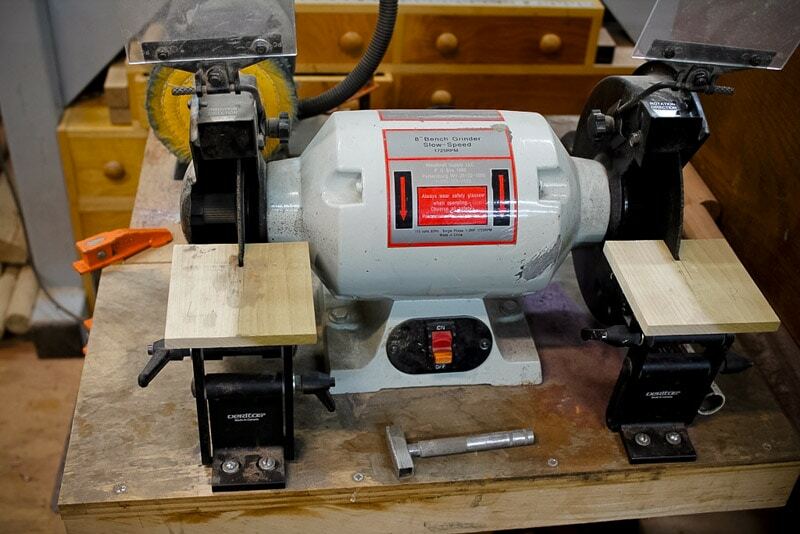 For very narrow profiles, I use an 8” slow speed grinder fitted with 7” metal cutoff wheels (purchased from Lowes). These wheels are made of a fiber composite, impregnated with a cutting material and designed to cut metal. They can be purchased as thin as 3/32” and can be shaped a bit with a diamond dressing stone. 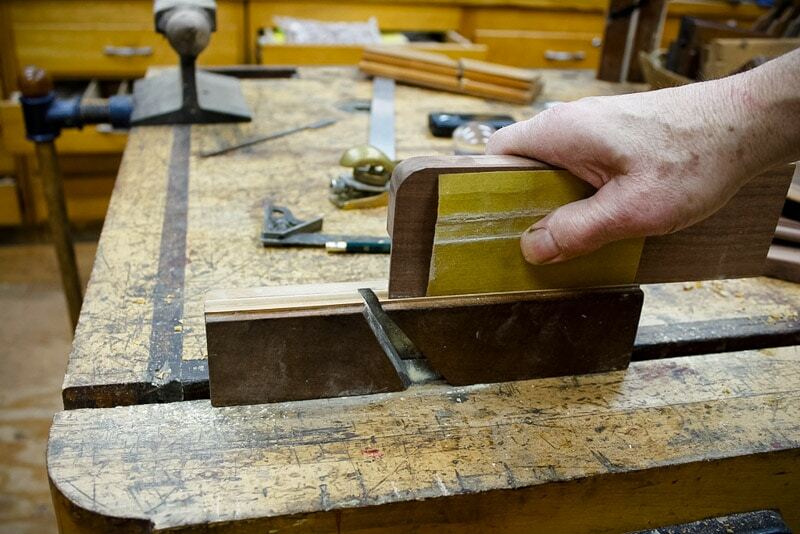 I use Veritas tool rests (here) fitted with wider and deeper wooden platforms. 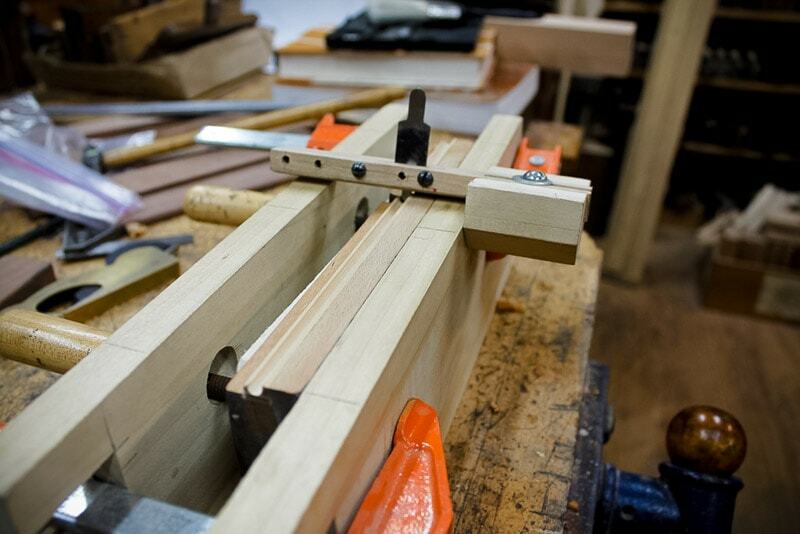 I generally keep the rests square to the wheels, and hold the iron with 8 fingers when cutting the bevels. Although the planes are meant to cut a half circle, since the irons are bedded at 45 degrees, the shape of the cutter is actually an ellipse. I always block out first the parts of the profile that only affect the length of the cutter (i.e., the bottom of the quirk and the bottom of the curve). Once I establish the profile length, I begin to tweak the parts of the profile that affect the width of the cutter (the two shoulders and the outside edge of the quirk. Any misstep with the curve or the quirk just means advancing the iron to recover. A misstep with any of the three shoulders means advancing the iron far enough up to eliminate the narrow part. This can consume a lot of iron and entail a lot of additional grinding. Generally I block out the profile square to the face of the iron until I am happy with the shape, then I work on the bevels. The two shoulders of the curve have very obtuse bevels. The left cheek shoulder disappears into the profile where the fence begins. The outside (right cheek) of the quirk is non-cutting. It is just like the outside edge of a shoulder plane iron. It needs to be proud of the edge of the quirk, but it is the outside corner that does the cutting. Once the bevels are established almost completely to intersect with the face of the iron, I use 200 and 1000 grit water slipstones to hone to the final edge. 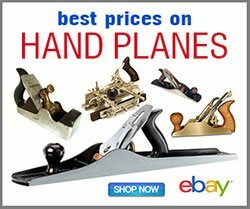 ***You can see much of Bill’s above instruction in his DVD “Choosing, Refurbishing, & Using Moulding Planes with Bill Anderson”. You can also see Bill’s portfolio and classes that he teaches here. I am formerly a research scientist for a drug company and for the EPA. Retired about 5 years. 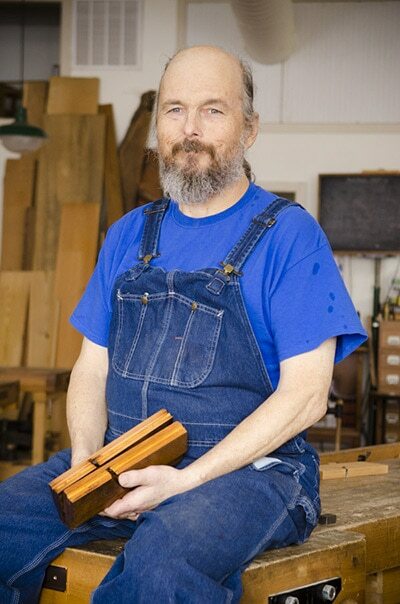 For about 10 years I have been teaching handtool woodworking in my shop, at Roy Underhill's Woodwright's School and at John C. Campbell Folk School in NC. 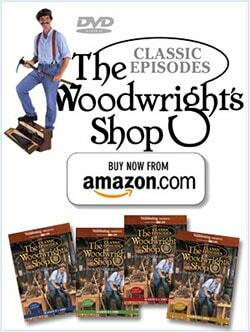 My primary interest in in making, rehabbing and using handplanes, and I have several DVDs out on these subjects. First of all I am blown away by the number and quality of articles on this site. I wished I had found it earlier. 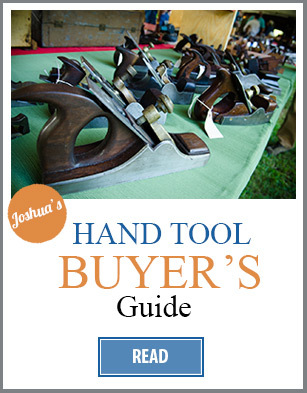 This article will be helpful as I recently found an antique shop near me selling tons of old planes and I want to by some and restore them. 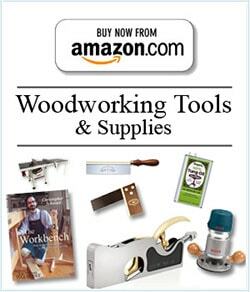 As for the giveaway, If I don’t win I would like the Shaker Candlestand video or the, “Got Handplane” t-shirt. Great info. Just what I needed. Thanks! BTW, would you please describe “pressure fitting” you mention as a possibility in the manufacture of some fully boxed planes?